Modern cosmological observations show that the dynamical formation of structure in the universe, in which gravity plays a major role, is driven by ingredients, of which the visible matter that we know of makes up only a small part. Much of the universe comprises unknown types of energy and matter, so named “dark energy” and “dark matter.” While scientists can observe and account for the effects of dark energy and dark matter on cosmological scales, they do not yet understand their fundamental nature. A resolution of this mystery would provide a fundamental understanding of physics that could benefit all fields of science and technology. 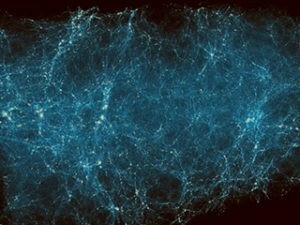 Cosmological simulations model the distribution of dark matter and the formation of galaxies based on various theoretical models of dark energy, dark matter, and even modifications of gravity. To test these different theories against observational evidence, researchers need to run accurate, extreme-scale simulations. These detailed, dynamic simulations cover billions of years of the evolution of the universe and demand the immense computing power to be available at the exascale. Exascale systems will also be used to simultaneously analyze observational data from state-of-the-art telescopes and from the simulations; these investigations will enable scientists to precisely determine the dark energy equation of state, characterize the properties of dark matter, test the theory of general relativity, and pinpoint outliers in piles of observational data that could lead to new discoveries. 11/05/16 The video shows a portion of a simulation of the cosmological structure formation from the HACC code's 'Q Continuum' run on Titan.